Alicia's Advice for Speaking Success: Why didn't I start Pinterest sooner - because it requires CHANGE! 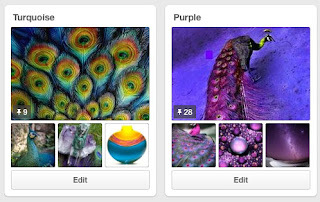 Why didn't I start Pinterest sooner - because it requires CHANGE! I am little slow when it comes to adapting new technology. As my husband says "You hate change." I do... I don't know why it's necessary to update your phone every 2 years. Mine was working just fine and now I have to learn a whole new set up, and my fingers don't punch the right buttons on the first go around... Ah, there in lies the issue: the perfectionist in me that I keep stuffing down. As you can imagine, it's no wonder that it took me quite some time to establish a presence on Pinterest. Oh, sure, I had been told by well meaning friends who are awesome social media gurus that my work is so visual that I REALLY SHOULD be active on Pinterest. I started my account a few years ago and found some cool pictures, ahem, excuse me, PINS: peacocks, home decor, flowers, peacocks, glass vases, landscapes, peacocks, nothing work related. - Keywords are, well, KEY! I did a search for the type of projects I would pin. I noticed my "competition" uses well placed keywords in the description of their pins. I have since rewritten a new description on each pin to display the keywords that my clientele will search for. - It's a Perfect Portfolio! For those who sell products (digital, tangible, print, etc), you should be pinning everything you create on your boards. For me, it's faster to upload things to Pinterest than to my own website. I will continue to have a portfolio on my website, but Pinterest makes it super easy. - Mobile Friendly! When people ask to see work I have done for my clients, I will be sending them here. Why? Because the images are optimized for mobile devices and more and more people are doing business on their phone and tablet. - Unlimited Categories! As an "attempting to recover from perfectionism," I LOVE it when things fit in a tidy, neat box. Therefor, I have categorized my boards to meet the various needs of the speaker. You can visit mine to see what I've done so far http://pinterest.com/aliciawhite911. Don't judge - I just started! Now it's your turn to get images of your products, write a description using keyorwds, and PIN IT! Alicia White, CEO of Back of the Room Productions™ and SpeakerSheets.com, helps speakers, coaches, authors, and business experts give their message legs long after they leave the stage through professional branding and powerful products. From speaker sheets to back of the room products, clients receive high-level graphic design and expert branding strategy that leads them to speaking success!